The artist Richard Dadd appears as a minor character in my sixth novel, Nina in Utopia. 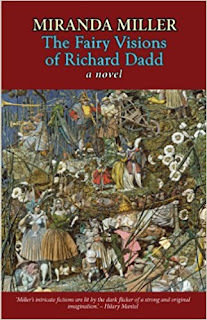 When I finished writing it he was still very much alive for me, so I decided to give him a novel of his own, The Fairy Visions of Richard Dadd. 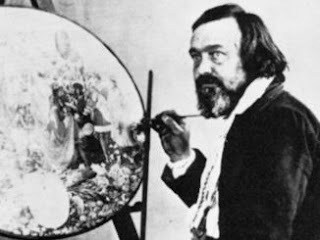 Richard Dadd was born exactly 200 years ago, in Chatham, in Kent. His father, Robert Dadd, was a chemist who lectured on Chemistry and Geology and was interested in both science and art. Richard was the fourth of seven children, four of whom were considered insane at the time of their death. When he was seven Richard’s mother died and his father remarried, but his second wife also died, leaving two sons. As a widower with nine children Robert Dadd must have worried about money and about their future. Richard, in his early teens, showed signs of talent as an artist and it may have been because of his vicarious ambition for his son that in 1834, when Richard was 17, the family moved from Chatham to London. Robert Dadd bought a framing, gilding and bronzing business in Suffolk Street. After teaching himself to draw in the British Museum, Richard became a student at the Royal Academy schools, which had just moved from Somerset House to the very new National Gallery, a five minute walk from his family house. As an art student at the prestigious Royal Academy Schools Richard was taught by Maclise, Etty, Landseer and Turner. He was considered exceptionally promising and won three silver medals, including one for the best life drawing. His closest friends were William Powell Frith and Augustus Egg, both of whom later had enormous success. Frith’s paintings, Ramsgate Sands, The Railway Station and Derby Day were immensely popular as pictures of everyday life that were just sentimental enough to flatter the idea of themselves that middle class Victorians had. When they were first shown at the Royal Academy they attracted so many admirers that a railing had to to put up to keep the crowds back. In Derby Day, (1858), Richard Dadd appears, wearing a fez. In my novel, which is set the previous year, Frith comes to visit Richard in the hospital. Augustus Egg’s most famous works, also painted in 1858, are three oil paintings called Past and Present, which show a woman who commits adultery and so falls from a state of married bliss, surrounded by her children, to become an outcast.This is the final painting. Didactic and moralistic, it appealed to Victorian taste. 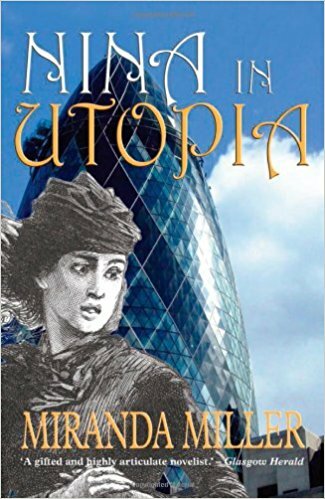 In Tate Britain you can see The Fairy Feller’s Masterstroke, Richard Dadd’s most famous painting, which appears on the cover of my novel (see above), Derby Day and Past and Present. I think it’s very moving to imagine these three ambitious young art students in the 1840s, getting drunk together and criticising each other’s work arguing furiously - and then, 170 years later, having their paintings hung in the same world famous gallery. Richard’s family couldn’t support him and when he finished his art course he had to struggle to get commissions. He had already exhibited work at the Society of British Artists, almost next door to his family house in Suffolk Street, and at the British Institution in Pall Mall. He was interested in imaginative art and was painting fairies, and although he managed to get various commissions then, as now, it was very hard to earn a living as an artist. He never would have been able to afford any kind of grand tour by himself but a Welsh solicitor, Sir Thomas Phillips,who had just been knighted by Queen Victoria for shooting Chartists, invited Richard to accompany him as his pet artist. Twenty years later, of course, Phillips would have taken a camera. In July 1842 the two men set out on a ten month journey to Italy, Greece, Turkey, Lebanon, Syria, Palestine and Egypt. 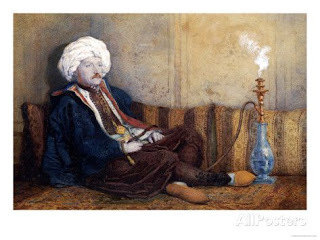 Here’s a drawing Richard did of his patron, all dressed up in traditional Arab robes. As Richard comments in my novel, Phillips looks more like a wet night in Pontypool than an Arabian one. This journey must have been fascinating, exhausting and confusing. Writing home to Frith, Richard said that when he lay down at the end of the day his imagination was “so full of wild vagaries that I have really and truly doubted of my own sanity.” He probably smoked hashish and it is now known that drugs can trigger schizophrenic episodes in vulnerable young people. Richard imagined that he was being persecuted by evil spirits who took on various forms: a sea captain, an old lady in the Vatican galleries in Rome and Phillips himself, and he became obsessed by the idea that he was a ‘catspaw’ of the Egyptian god Osiris. When they reached Paris, on the way home, Phillips wanted him to see a doctor but at the end of May 1843 Richard fled back to London. That summer Richard’s behaviour became increasingly strange and paranoid. His friends and family were naturally very worried about him and his landlady was terrified of him. Richard’s father, Robert, insisted that his son was suffering from sunstroke and needed rest and quiet. 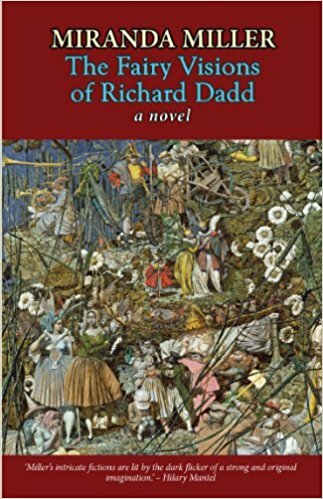 Soon after Richard’s twenty-sixth birthday, Robert Dadd took him to see Dr Alexander Sutherland, a famous ‘mad doctor’ at St Luke’s Hospital in Old Street, who told him that his son was very ill and should stay in the hospital. Despite this Robert Dadd was convinced that he knew his son better than anyone else and that a trip to the country would help. Father and son set off together for Cobham, in Kent, to revisit the area where Richard had grown up. That night they went for a walk in the grounds of Cobham Park, where Richard stabbed and killed his father. It was one of the most sensational Victorian murders. Richard had brought a spring knife, passport and money to Cobham with him, so the murder was clearly premeditated. After killing his father Richard fled abroad. He later told a doctor he was on his way to assassinate the Emperor of Austria and was soon arrested after he tried to cut the throat of a fellow passenger in a carriage in France. Eventually he was extradited and in August 1844 was confined for life to the criminal lunatic department of the Bethlem hospital, or bedlam, which was in the building that is now the Imperial War Museum. The most impressive thing about those long years of incarceration is that they were not lost; Richard continued to draw and paint and here is one of my favourites. It’s known as The Flight out of Egypt but we don’t know what Dadd himself called it; it certainly isn't a straightforward biblical story. 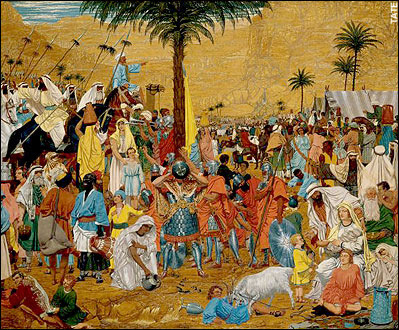 The colours are vivid and beautiful and it seems to be a mixture of his own intense experience of travelling through the hot desert and encountering a phantasmagoria of palm trees, people of all ages and races, pilgrims on their Haj, soldiers in Roman uniforms and, perhaps, unexpected aspects of himself. Like The Fairy Feller’s Masterstroke, this painting remains mysterious however many times you look at it. I expected to find that patients in a mental hospital in the 1850s were treated abominably but, when I visited the Bethlem archives at Eden Park in Kent, I discovered that in 1853 a new young Resident Physician, Dr Charles Hood, was appointed. He carried out a number of reforms after a public scandal about the way the inmates were mistreated. Dr Hood abolished chains and other mechanical restraints and tried to make the wards comfortable. In 1857, the year my novel is set, an article in Household Words, the magazine Dickens edited, described a visit to the hospital and concluded hat “thousands of middle class homes contain nothing so pretty as a ward in Bedlam,” and that, “as to all the small comforts of life, patients in Bethlehem are as much at liberty to make provision for themselves as they would be at home”. Dr Hood removed bars from the windows and introduced aviaries, pets, plants and pictures to the wards. Keepers were given training and became more like nurses and patients were encouraged to occupy and entertain themselves. All the time I was writing about Richard Dadd this photograph of him haunted me and I looked at it constantly. It was taken in about 1857, the year my novel is set, and shows Dadd, aged 40, in the hospital at his easel, where the unfinished oval of Contradiction: Oberon and Titania (another of his fairy paintings) sits, waiting for the brush he holds to continue to bring it to life. He stares at the camera, at us, with recognition and warmth, looking more like an artist in his studio than a prisoner in his cell. In fact 1857 was the year when Dadd was moved from the grim, Home Office block at the back of the hospital, where the criminal lunatics were housed, to the main part of the hospital, where he was given a spacious room to paint in. He went, quite literally, from darkness to light and this resulted in his best work, although he had heroically carried on painting and drawing even during the thirteen years when he was incarcerated in the overcrowded and dungeon- like conditions of the criminal lunatic block. The doctors in the hospital encouraged and even collected his work. In 1863 he was transferred to the new Broadmoor hospital in Berkshire, where he remained until his death in 1886.